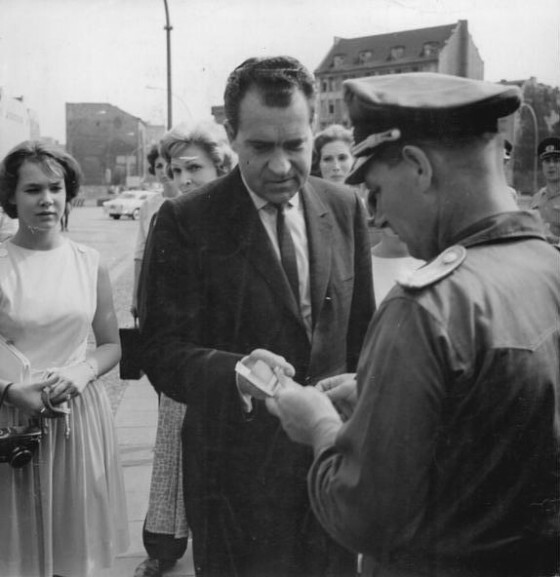 Richard Nixon at the East-West border of Berlin in 1963, showing his papers to an East German officer for entry into East Berlin. Before President Nixon took office, stalemate defined the condition of East-West negotiations. A slight reprieve in the stalemate occurred during the 1967-68 negotiating season but was ended abruptly following the Soviet Union’s invasion of Czechoslovakia. At the onset of a new administration, no firm structure existed that allowed for successful negotiating solutions. Issues pertaining to the division of Berlin proved particularly arduous. Several attempts to ease tensions over a divided Berlin produced conflicting legal arguments, administrative practices, and political and economic interests. The Nixon administration regarded the resolution of concrete issues dividing Europe as paramount to a successful foreign policy of detente–the easing of hostility or strained tension between countries through negotiation rather than confrontation. One of these issues involved 20 years of disagreement over the ideal solution for Berlin. Though the ideal solution to the question of Berlin was reunification, it was simply not a possibility in light of tensions among all responsible parties. The ideal solution–reunification of Berlin–was not feasible. On the other hand, it was unacceptable to us to treat West Berlin as a separate political entity deprived of its natural ties to the Federal Republic or the security guarantee of the three Western powers. President Nixon’s philosophy was that issues related to the division of Germany were of natural and direct concern to all European powers. Therefore, all responsible parties–the U.S., the U.K., France, and the USSR–should recognize the inevitability of a divided Berlin and work for a constructive relationship on this basis. –The Soviet guarantee of unimpeded and preferential civilian traffic between the Western sectors of Berlin and the Federal Republic is a central fact of the agreement and a major improvement. –There is no change in the legal status of the Western sectors of Berlin: they remain under the authority of the three powers, who share with the USSR responsibility for the city as a whole, and they continue, as in the past, not to be regarded as a constituent part of the Federal Republic. At the same time, the Soviet Union has formally accepted that the vital ties between West Berlin and the Federal Republic will be maintained and developed. –The Soviet Union has accepted that communications between West Berlin and East Berlin and the German Democratic Republic, and West Berliners’ visiting rights, will be improved. It has further been agreed that, where the security and status of the city are not involved, the Federal Republic may represent the Western sectors of Berlin abroad and that international agreements and arrangements entered into by the Federal Republic may be extended to the Western sectors. –The three Western allies have authorized the establishment of a Soviet Consulate General and additional Soviet commercial offices in the Western sectors, accredited to the appropriate authorities of the three Western powers. No change in Berlin’s status is implied; the Soviet presence in the Western sectors will still be subject to allied authority.